Mexico was the first developing country to release its post-2020 national climate action plan, or intended nationally determined contribution (INDC), committing to reduce its emissions 22 percent by 2030 or up to 36 percent under certain conditions like an international carbon price and enhanced support from other countries. 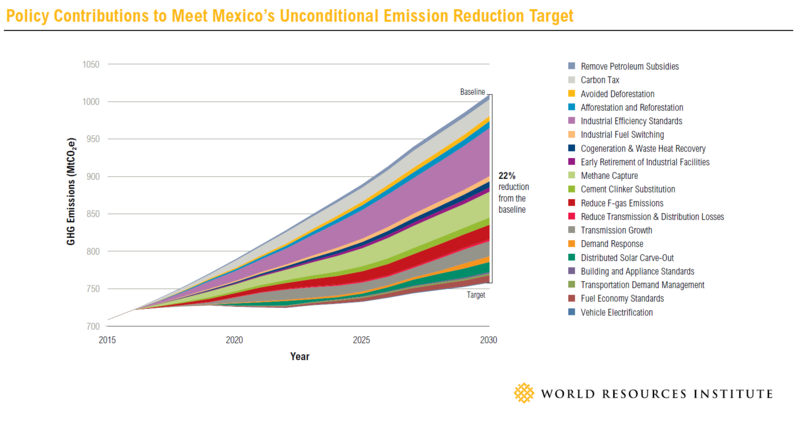 New WRI analysis finds that it’s not only possible for Mexico to meet these goals, it’s economically beneficial—reducing emissions by 22 percent would save the country $26 billion between 2017 and 2030. Mexico could also see benefits in the form of improved human health, thanks to better air quality due to a cleaner vehicle fleet and reduced fossil fuel combustion. 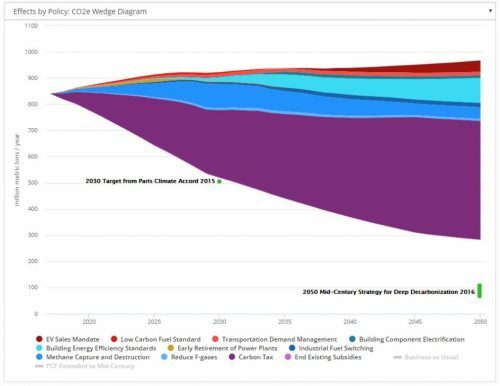 Actually achieving these emissions-reduction targets won’t be easy—our analysis finds it will require transformative changes in key sectors. But just three policies—boosting industrial energy efficiency, implementing a carbon tax and capturing methane from natural gas extraction sites—could deliver more than half of the necessary reductions. Our eight-point action plan outlines the specific steps that can help steer Mexico toward its emissions-reduction targets. Four policies are particularly promising: industrial energy efficiency standards, substituting clinker (a compound used in cement manufacture) with low-carbon alternatives, cogeneration and waste heat recovery at industrial plants, and the early retirement of inefficient facilities. These measures have not only strong political support in Mexico, but also high potential uptake in the private sector. Following through on this step could deliver 38 percent of the necessary reductions. Non-CO2 gases account for a quarter of Mexico’s emissions and represent a large source of potential reductions in the near term. Reducing these emissions can also deliver significant development benefits like new jobs, improved health, and increased crop yields, while delivering 21 percent of the necessary reductions. Mexico should continue to address methane emissions by reducing leaks and venting from oil and gas activities, and capturing these emissions at solid waste disposal sites and wastewater treatment plants. Tackling hydrofluorocarbon (HFC) emissions, potent greenhouse gases commonly used as refrigerants, will be equally important. Mexico recently committed to regulate and reduce HFCs, and has also worked for years toward the recent global agreement to phase down HFCs. In Mexico, carbon pricing is a recent instrument that has been applied rather modestly through a tax on fossil fuels. Expanding this to an economy-wide carbon tax could be a key instrument to achieve Mexico’s emissions-reduction targets. The country could also learn about the design of effective carbon-pricing systems from subnational governments in the United States and Canada. In addition, the Ministries of Finance and Public Credit, Economics, and Energy should work together to phase out remaining fossil fuel subsidies. Taking these steps could provide 11 percent of the needed reductions. Increasing the transmission capacity and efficiency of the electricity grid allows for more renewables to come online and also reduces losses in distribution—both of which are needed to cut emissions in the electricity sector. Mexico already has plans to increase its transmission capacity, and the Clean Energy Auctions launched in April 2015 (auctions of 15-year contracts to provide renewable power to the grid) provide strong legislative and financial support to these efforts. Completing this step could deliver 17 percent of the reductions needed. For example, enhancing the conservation and restoration of wetlands and preserving coastal ecosystems services (activities which also increase carbon sequestration). Importantly, the Ministry of Environment and Natural Resources and the National Forestry Commission must reduce the complexity of the forestry sector’s legal framework by harmonizing federal laws, regulations and objectives related to sustainable forestry management. These steps could contribute 6 percent of the necessary reductions. Mexico’s Ministry of Transport should focus on three key areas to reduce emissions and air pollution from transport: transitioning to an electrified and/or cleaner fleet, investing in public transportation and developing walkable communities, and strengthening fuel economy standards. These actions could provide 5 percent of the necessary reductions. The United States, Canada and Mexico recently agreed to align fuel efficiency and/or greenhouse gas emissions standards for light and heavy duty vehicles by 2025 and 2027, respectively, which should spur more ambitious action. While emissions from the building sector are not that high in Mexico, energy efficiency is a cost-effective option for cutting electricity use and curbing emissions. Mexico should strengthen its current efficiency standards and broaden the scope of existing bilateral and multilateral energy efficiency programs, such as Mission Innovation and Sustainable Energy for All. These steps can provide 1 percent of needed emissions reductions. As Mexico makes plans to reach its emissions targets, it should consider the risk that some pathways may lock-in fossil fuel infrastructure. This would compromise the ability to achieve net-zero greenhouse gas emissions in the second half of the century, a global goal outlined in the Paris Agreement. Aligning its plans with the goals of the Agreement may require Mexico to phase out fossil fuel infrastructure sooner or electrify the vehicle fleet faster than current plans. Implementing this eight-point plan can put Mexico on a path toward achieving its emissions-reduction targets, boosting economic competitiveness, and improving the health and wellbeing of the Mexican people. This post was originally published on World Resources Institute’s blog on November 3rd, 2016.